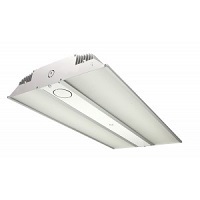 Maxlite Baymax is design to be a linear high bay solution. This product comes at 25,000 lumens of light output from 200 watts. It's settings for usage are compatible with warehouses, distribution centers, manufacturing facilities, big box retailers, and other high ceiling applications. This item has a 10 year warranty and approved to be DLC Premium 4.1.